We asked artist Sarah Taylor, who worked on product development at Derwent for 5 years, about the differences between Watercolour Pencils and Inktense Pencils…. “It’s quite simple really, If you think about watercolour pencils as Watercolour paint in a pencil form, when you add water to them you’re making watercolour paint. We can apply the same reasoning to Inktense, when you add water you’re making a kind of ink – it really is that simple! Watercolour is almost opaque and subtle. The colour can be lifted out and diluted to paler shades, which are beautiful. With Inktense, the colours are much more translucent, like ink. When you add water you actually intensify the colour that the pencil laid down. It stand out much more, like a burst of colour! The big difference amongst other pencils is that once you’ve laid the colour down and it has had chance to dry, the pigment is permanent, meaning you can layer colours over one another without turning it into a big brown mush. Because Inktense pigments are permanent once dry, it means they can be used in all manner of different applications, like silk painting and fabrics. I’d recommend adding a bit of fabric medium to the water if you’re intending to wash the piece, as it will help protect your work. Another hint with silk painting is to use Aloe Vera gel instead of water to control how much the colour spreads. 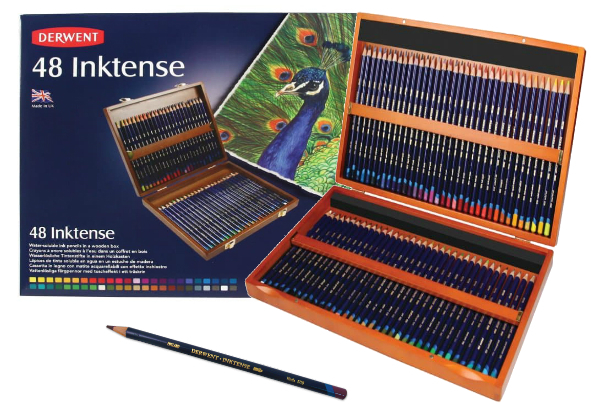 Even if you’re not a professional artist and just want to have some creative fun , Inktense Pencils are perfect for colouring! Due to the bold colours they create and the permanence of the ‘ink’ once it has dried, it makes ideal artwork to frame or send to others that will stand the test of time. Why not think about partnering them with Unwind in the Wilds? You can watch more of Sarah Taylor’s videos for Derwent over at our Official YouTube channel or find out more about Sarah at www.sarahtaylorart.co.uk. *Please note, this video of Unwind in the Wilds contains Sarah’s work with Coloursoft. Next Post:Laura Hickman introduces Graphic Pencils to the catwalk!